Bangko Sentral ng Pilipinas (BSP) showcases the Malampaya model as an example of successful private-public partnership that nurtures business growth in the Philippine energy sector. The Malampaya Deep Water Gas-to-Power Project’s example of public-private partnership success that nurtures business growth in the Philippine energy sector was showcased by the Bangko Sentral ng Pilipinas (BSP) Investor Relations Office (IRO) to international credit rating agency Standard and Poor’s (S&P) during its annual dialogue with the Republic of the Philippines. The Malampaya Gas Project is spearheaded by the Department of Energy, and developed and operated by Shell Philippines Exploration, B.V. (SPEX) on behalf of its Joint Venture Partners. SPEX, the upstream operating company of Shell in the Philippines, conducted a briefing on the Malampaya Gas Project with S&P Associate Director Agost Benard and Director Takahira Ogawa, and Investor Relations Office’s Acting Executive Director Editha L. Martin and Acting Bank Officer V Rica Amador in attendance last March 26, 2014. 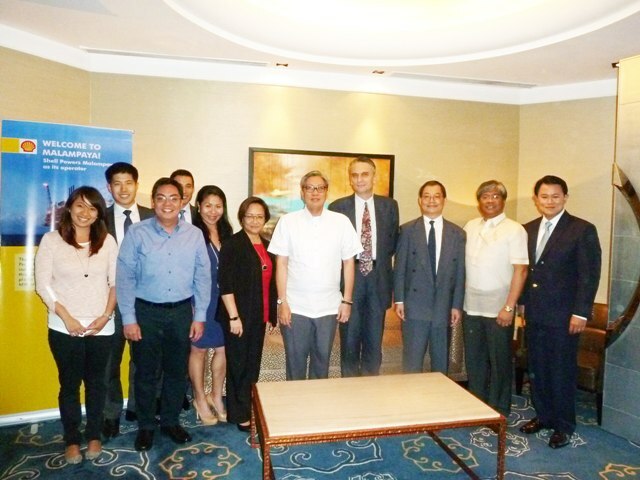 In photo are [from left to right] Malampaya Project Communications Advisor Christine Guison, Standard Chartered Associate Director Tom Lu, Shell Upstream Communications Manager Paulo Gavino, Standard Chartered Director Scott Wong, BSP Acting Bank Officer V Rica Amador, BSP Acting Executive Director Editha Martin, Shell Philippines Country Chairman Edgar Chua, Standard and Poor’s Associate Director Agost Benard, Standard and Poor’s Director Takahira Ogawa, SPEX Managing Director Sebastian Quiniones and SPEX Finance Manager Jeng Pascual. SPEX Managing Director Sebastian Quiniones and SPEX Finance Manager Jeng Pascual explained how Malampaya contributes to sustained national growth and development. The Gas Project is the outcome of strong public-private partnership that enabled the construction of Malampaya facilities including the natural gas power plants First Gen and Ilijan, and Malampaya Phases 2 and 3 (MP2 and 3). Since it started commercial operations in 2001, the Malampaya Gas Project has contributed billions of pesos worth of government revenue share, proving that natural gas provided by Malampaya is not just beneficial for the environment, but also for sustained economic growth. “Malampaya serves as an inspiration for the future of the country’s natural gas industry. As a pioneer in the country’s gas industry, Malampaya should serve as the model for shaping the future gas infrastructure and gas market in the country,” said Quiniones. “The successes of Malampaya prove the capability and resilience of the Filipino spirit. The Malampaya offshore gas platform and onshore gas plant are handled by 100 percent Filipino crew and MP3’s new platform is being fully fabricated in the Philippines.” Quiniones is the Malampaya Gas Project’s first Filipino Managing Director. Before the fly-by trip of the Malampaya Offshore Gas Platform. [From left to right] SPEX Maintenance and Engineering Engineer Raymond Gavino, Shell Upstream Communications Manager Paulo Gavino, Bangko Sentral ng Pilipinas (BSP) Investor Relations Office (IRO) Officer-in-Charge Editha L. Martin, BSP IRO Acting Bank Officer V Rica Amador, Standard and Poor’s Associate Director Agost Benard, Malampaya Project Communications Advisor Christine Guison, SPEX Maintenance and Engineering Engineer Jericho Rivera and Malampaya Project Accountant Jayjay Perlado. 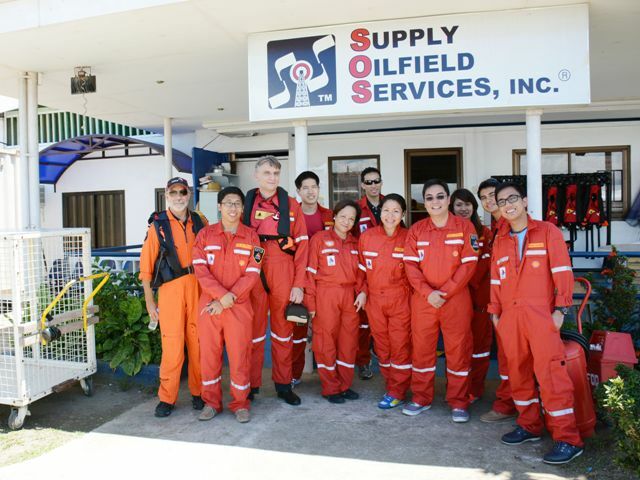 A fly-by trip of the Malampaya offshore gas platform in Palawan was organized by SPEX the next day for S&P and BSP officials to fully appreciate the technologically innovative gas project. Editha L. Martin of the BSP’s IRO said Malampaya is a testament to the benefits of public-private partnerships. “Malampaya is one of the leading examples of successful public-private partnerships in the Philippines that not only supports business growth but also helps fulfill the government’s goal of achieving energy security and independence through the development of renewable and indigenous sources,” Martin said. “The decision of SPEX to beef up its stake in the Philippines through the expansion of Malampaya as well as other significant investment projects of Shell companies are clear signals of their confidence in the country’s strong macroeconomic fundamentals and bright prospects,” Martin added. Malampaya has provided mutual benefits for the private-sector investor, SPEX, and the government. The former has been able to do good business in the Philippines, while the latter has been able to perform its duties of securing the country’s energy supply, boosting public revenues and generating jobs. The Malampaya Gas Project provides 30% of the country’s energy needs with cleaner-burning natural gas. More than supporting energy security, the project also enables the transfer of technology and expertise that enhances Filipino capability to meet the stringent standards of international oil and gas industries. 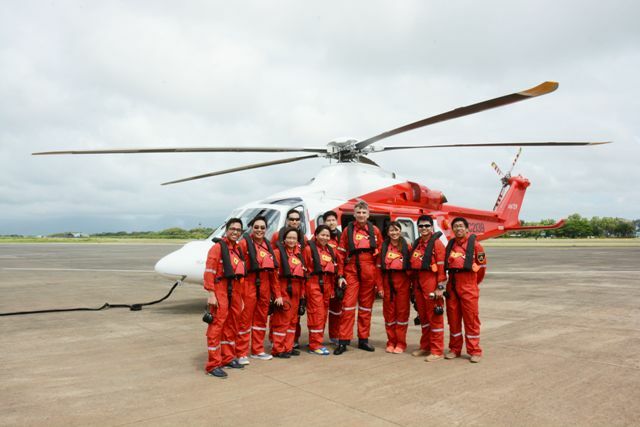 Shell employees accompany Bangko Sentral ng Pilipinas and Standard & Poor’s officials to the Malampaya fly-by trip. In photo are [left to right] HNZ Captain Joseph Neill, Malampaya Project Accountant Jayjay Perlado, S&P Associate Director Agost Benard, BSP IRO Officer-in-Charge Editha L. Martin, BSP IRO Acting Bank Officer V Rica Amador, Shell Upstream Communications Manager Paulo Gavino, Malampaya Project Communications Advisor Christine Guison, SPEX Maintenance and Engineering Engineer Jericho Rivera and SPEX Maintenance and Engineering Engineer Raymond Gavino. The Malampaya Gas Project is operated in socially, environmentally and economically responsible ways by SPEX using expertise drawn from Shell’s extensive global experience in deepwater technology and oil and gas exploration and production. Two months after visiting the Malampaya gas platform, S&P raised the Philippine foreign currency denominated and peso debts a notch above the coveted credit rating of investment grade that was acquired by the country a year ago. The credit rating agency recently gave the Philippines a long-term sovereign credit rating of “BBB” from “BBB-”, and upgraded its short-term rating to “A-2” from “A-3”. S&P noted that the Philippine outlook is stable and this is not likely to change in the next 12 months. S&P skipped the assignment of a “positive” outlook on the country and went ahead with raising the country’s credit ratings. Bangko Sentral Governor Amando M. Tetangco, Jr. welcomed the immediate upgrades. “This action is further affirmation of the country’s strong macroeconomic fundamentals,” he said, noting that the Philippines has proven it can sustain growth since S&P raised the country’s credit rating to investment grade last year. The higher credit ratings mean greater investor confidence, more jobs and better quality of life for Filipinos. “We congratulate the Department of Finance and Bangko Sentral on this major feat for the country,” said Edgar Chua, Shell companies in the Philippines Country Chairman.